Bonny Eagle standout Kialeigh Marston runs the 4x800 at Scarborough on Friday. Scarborough played host to more than a dozen other schools – including Bonny Eagle and Windham – last Friday, May 9 in the annual outdoor relays. Edward Little finished first at the meet, tallying 88 points as a team; Bonny Eagle finished fifth with 49; and Windham finished 14th with 17. The Scots looked particularly strong in the 4×100, where they took second, and the 4×400, where they won outright. They also took first in the 4×800 and the 4×1600. The Eagles, meanwhile, pulled down good points in the High Jump, with Alexis Wintle earning third and Justice Gaston tying for a share of fifth. Wintle also finished second in the Triple Jump. Bonny Eagle standout Kialeigh Marston runs the 4×800 at Scarborough on Friday. 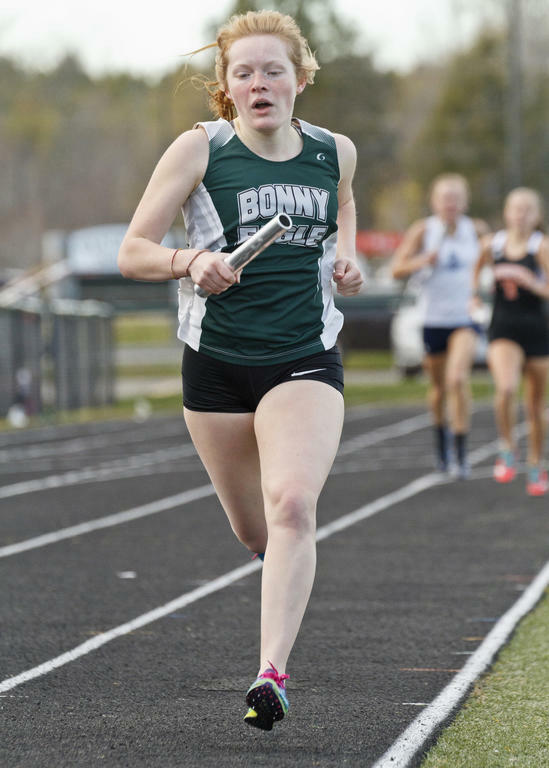 Lauren Smith runs a heat of the 4×100 for Bonny Eagle at Friday’s Scarborough Relays. Sarah Packard competes in the 4×800 for Windham at Scarborough last Friday.